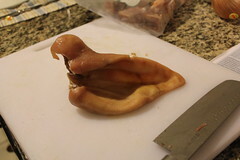 This is a pig's ear. It is part of the "Tripes Les Halles" recipe I'm making. I'll be serving the full dish Saturday night. Culinary adventurers are needed to help eat it - it feeds 12. I mean, not just this ear, but other bits and bobs and parts. Interested? Drop me a line - you're invited!